We have adult swimming squad training throughout the year every Monday and Wednesday night from 7:00pm to 8:30pm at the Casey ARC next to the Fountain Gate shopping centre in Narre Warren. The only prerequisites are that you are at least 18 years old, can swim a few lengths of the pool and have a love of swimming. If you're not quite up to swimming with the squad yet, don't worry. Come down and have a chat with our coach to work out the best course of action. One option that we might suggest is that you enrol in adult swim lessons at Casey ARC to bring you up to the point where you will feel comfortable and confident enough to start swimming with us. If you would like to try a training session, aim to arrive at the pool deck about 10 minutes before the start of the session. You will find us at the deep end of the pool (closest to the entry to the complex). You'll need to bring bathers, towel, swimming goggles and a drink bottle. Swim fins are also often used (the shorter swimming type is better, rather than the large diving fins). Your first 4 swims are FREE! for anyone interested in joining the squad, as an incentive to come and try us out. If you are unsure of whether the training is suitable for your level of swimming, come along and have a look, and have a chat to our coach or any of us. Alternatively, call one of the Committee members and we'll tell you a bit more about it. This is paid directly to the club Treasurer on pool deck before you get into the water. Note that the training fee does not include the pool entry fee. If you are paying casual pool entry fees at Casey ARC, remember to tell the staff when paying that you're training with the Casey Seals masters squad to get the club discount entry fee. If you are going to be swimming at Casey ARC or Casey RACE regularly, you might find it cheaper to take out Aquatic Membership with the YMCA. It's even cheaper if you have more than 1 person in your family taking out membership. Full Membership of Casey ARC is also an option, giving you access to all the centre's facilities including a well-appointed health club - a very cheap rate if you want to use a gym as well as swimming. Ask the pool reception staff for more information and current prices. Coaches are an integral part of any club's continued success, and we have been fortunate to have had excellent coaches since our club's inception back in November 2001. In 2013, when Frank Haas was unable to continue coaching on Monday nights, Jen Veres stepped up to take on the coaching role. She has a wealth of swimming experience which she is now enthusiastically applying to us from the pool deck. Having an elite swimming background, Jen has competed at State and National level in 50m and 100m butterfly. After some time off from swimming, she began training and competing as a Masters swimmer, and has set a number of Victorian butterfly and freestyle records. She has since gone on to complete a number of different coaching qualifications to add to her wealth of knowledge. These include: Masters Swimming Australia Club Coach Accreditation, Swimming Australia Teacher of Competitive Strokes, and most recently, her ASCTA Bronze Licence. These courses have provided her with a number of new skills and techniques which she has been able to apply to the Casey Seals training programs. In addition to all this, Jen is also completing her PhD in Management at Monash University. While coaching the Casey Seals, Jen also coaches Junior Squad with Aquastar Swim School, and hopes to one day become an ASCTA Silver Level Coach. Sean filled in for Jen when she took 2 months off over the 2015/16 summer for a well-earned holiday. Sean then took over Wednesday nights from 24 Feb 2016 when Jen needed to cut back her coaching hours because of her other commitments. Currently he is studying for a sports science degree at Deakin Uni in Burwood. He was a top-level age-group distance swimmer so he can combine his swimming experience with his knowledge of exercise physiology and nutrition from his studies to provide not just great coaching but also individual advice about gym programs and strength & fitness training. Casey ARC has a moveable boom which allows the 50m pool to be divided into two 25m pools. 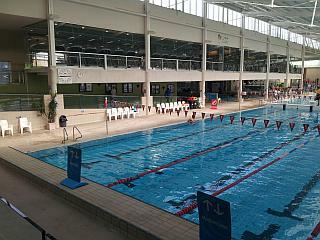 The boom is normally in the middle of the pool during the day between 9:00am and 8:00pm, creating two 25m pools. It is moved to the deep end around 8:00pm, and is moved back to the middle around 9:00am. On public holidays the boom is left at the deep end. Normally, most of the evening training sessions are in the 25m pool at the deep end. At around 8:00, (i.e. after an hour or so), the boom is moved so the last part of training is in a 50m pool. Being able to train in both pool lengths is invaluable for pool competition swimmers because pool racing is held in both long-course and short-course and this allows them to get used to both types of competition.